India’s economy has been averaging a steady seven percent growth over the past few years. Amid the declining optimism among other emerging economics, India’s outlook remains positive. The Bharatiya Janata Party (BJP)-led National Democratic Alliance (NDA) government has introduced a multitude of economic programs since 2014. Make in India remains the flagship initiative, while all other development programs seek to complement it. The International Monetary Fund (IMF) projects an optimistic 7.5 percent growth rate for India in the fiscal year of 2016-2017 – up from 7.3 percent in 2015-2016. India has replaced China as the top location for foreign direct investment (FDI) by attracting U.S. $63 billion worth of FDI projects in 2015 with FDI increasing by 30-40 percent in the past two years, according to Finance Minister Arjun Jaitley. However, while India represents a promising future as an emerging market, it has various regulatory and tax issues that strongly contrast with other emerging economies. Red tape and bureaucracy can further contribute to delays, adding roadblocks to a company’s growth. In such a market, it is imperative for companies to conduct due diligence to safeguard their assets and reputation. 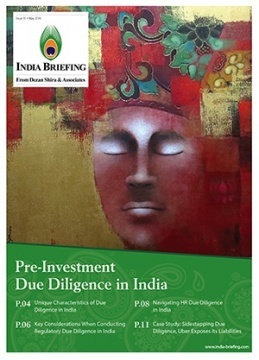 Foreign companies should be quick to notice the various idiosyncrasies of India’s laws and regulations; this India Briefing Magazine aims to prepare and guide companies to mitigate such issues.